Spent the day recently in Manchester with Jack Whitehall and the fine cast of “Fresh Meat”. This was to shoot the specials shots for C4 to use as press for the promo of series 3. However my day was full of flashbacks,as the set that they film on looked scarily like the hostels i lived at while at Art school.We shot this picture on the landing and all the bedrooms were off it .It was the strangest feeling walking into what appeared to be other students bedrooms.I almost expected someone to come in and catch me just hanging out in their room.I remember wondering if my college digs were as grubby as this,then decided they were actually much worse. Id like to think my tidying up skills have improved since then ! 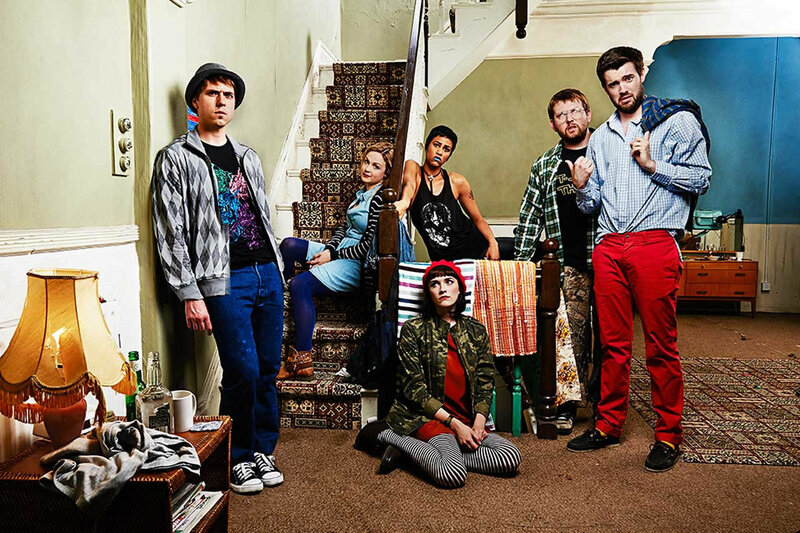 Jack Whitehall and the cast of Fresh Meat.